|| CHARLIE || by Made with Love. Full length feminine wedding gown with gorgeous lace trail in pristine condition. Immaculate lace detail throughout with no damage. Currently has cups sewn in, but they can be easily removed if required. It also inclucdes extra cups if a little more padding is needed. Comes with original Made with Love hanging bag for easy storage. Would suit size 6-8 AUS. I bought this dress a few months ago for my wedding this year however we are now expecting a bub so I have had to change my dress choice for the big day! 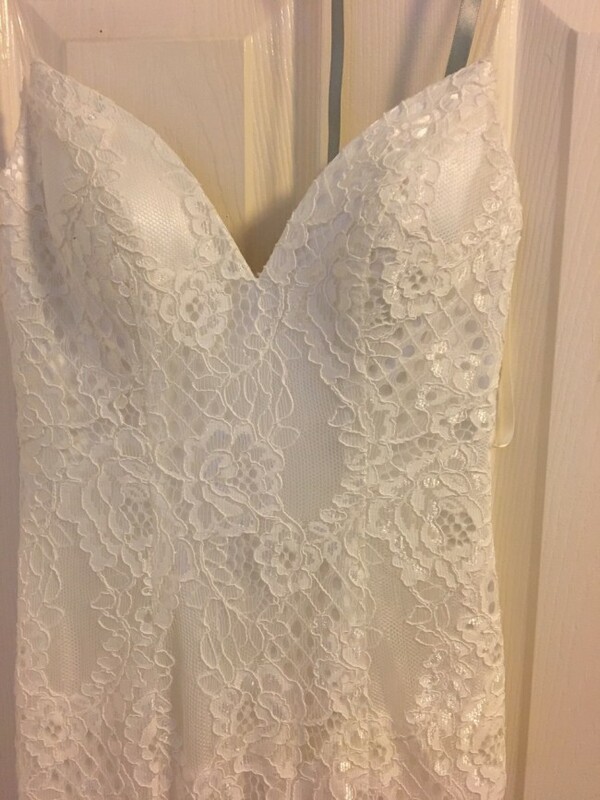 Bought on Still White as a used wedding dress. It is in pristine condition and was dry cleaned by previous owner. I am sad to see this dress go as the detail is just beautiful. Hopefully someone else can use it for their special day. Price is low as I need a quick sale in order to buy another dress that will suit my growing belly. Once you send a message, Elly can invite you to purchase the dress.